In this tutorial, we will go discuss how to handle single and multiple file(s) upload with Node.js and Express back-end, and save uploaded files on the server. First of all, let's create a new Node.js app by running the below commands. I am using npm for package management. It should be fine to use yarn if you like. express - Popular web framework built on top of Node.js. We'll be using it for developing REST API. body-parser - Node.js request body parsing middleware which parses the incoming request body before your handlers, and make it available under req.body property. In short, it simplifies the incoming request. cors - Another Express middleware for enabling CORS (Cross-Origin Resource Sharing) requests. express-fileupload - Simple Express middleware for uploading files. It parses multipart/form-data requests, extracts the files if available, and make them available under req.files property. morgan - Node.js middleware for logging HTTP requests. After installing the required dependencies, let's start creating our Express server. The above code is very much simple to understand. It first setups express-fileupload middleware to enable multipart/form-data requests. Afterwards, other Express middleware are added to allow Cross-Origin Resource Sharing (CORS), request body parsing and HTTP request logging. At the end, it starts the server at port 3000. Let's create our first route that allows users to upload their profile pictures. The above code snippet is a HTTP POST function. When you send a multipart/form-data request to /upload-avatar route to upload a file, this function saves the file to uploads folder on the server. Let's start creating another route to allow users to upload multiple photos at once. 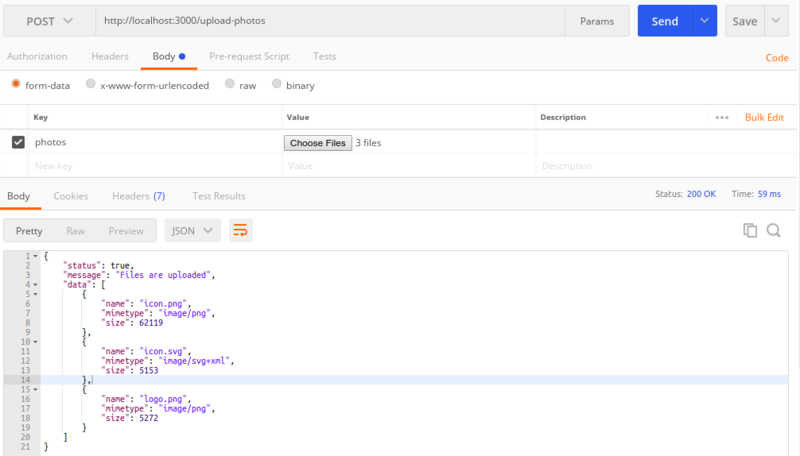 The above code is quite similar to single file upload, except that we now receive a field photos instead of avatar. We use lodash utilities functions ( _.forEach() & _.keysIn()) to loop over photos field and then save each photo to uploads directory. That's all folks! We learn how to upload single and multiple file(s) using Node.js and Express framework. express-fileupload is an easy-to-use Express middleware for handling file(s) upload. Checkout its documentation for more configuration options. If you have any question or feedback, please feel free to send me a tweet anytime.